It's Monday...how did that happen?! Did anyone else's weekend fly by!??! Lewis Black and the Ryman with one of our favorite couples on Saturday night. All wrapped up with more blackberry cobbler on the couch watching The Oscars! Really? Who thought it was a good idea to sequin a bowling shirt and make it a dress? Her stylist should be fired, wasn't she on my worst list last year too? I just don't know what is going on here...the hair, the fully sequined dress, I just think she looks like something out of futuristic movie...and I am not feeling it. I had to do double take...a couple times....to figure out who this was. She looks waaaay too old for her age. I thought it was Kate Winslet...which isn't a bad person to look like expect that she is probably about 20 year older! Terrible. I hated it. Her hair looked fried, she looks border line crack addict, her skin was way to pasty to be poking that leg out all night - and how stupid and annoying was that!??! Can you tell I am not a fan?! Really?!?! Fire your stylist, honey. Was she trying to be a dressy lady bug?! 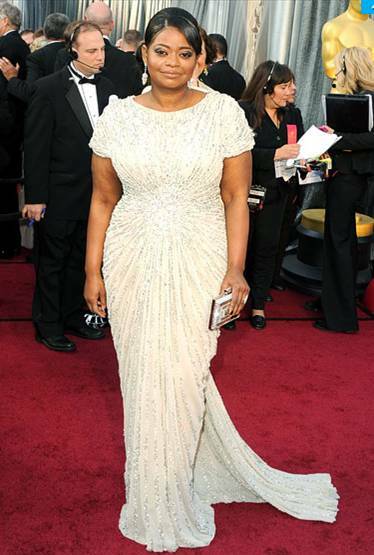 Next up, my "I like the effort, but not sure the final look was there..."
Okay, I love Meryl Streep, she is fabulous. And I do love this dress...I just feel like it is a lot of material and it doesn't seem to fit her right? Is it just me? Again, I adore her...one of my faves! But again again, a lot of material...and that bow is a little much for me. This would have been gorgeous without that stupid rosette thing....what is that!? I just don't know...I love this in some pics and in others I just don't think it is flattering at all. Now on to the best part.....the best dressed! Katie, I love this dress...the color, the hair up the fit...love! Tom, I could do without. Loved this too, she just needs a pretty earring! Looooooooooove this! Love! The color, the feathery-ness of it, her hair and her make-up! This color is fabulous...and she is fabulous! As I have mentioned before I am not a huge fan of the full sequins....but I do love this. Her hair looks great with the one strap and the earrings. Weird hair, but hey, that's her! And that dress is awesome, I think it is my second top pick! Another one of my top faves! Love the clean lines and then the waterfall! And she is just fabulous, soooooooo glad she won!! I believe this is my winner, my absolute fave...minus the bow....but I love the tiers of this dress and the way it fit her. Lovely. So those are my picks...which are your faves and hates? too funny, you were cracking me up. I hate Angelina Jolie so I'm with you on her [Team Jennifer] - more than anything I thought Angelina needed to eat a cheeseburger... skin-ny! I agree with your loves too, so cute - Katie Holmes and Michelle Williams were my faces - Dawson's Creek FTW! Angelina looked like a serioussss crack addict. Ridiculous...and that leg...what the hell?? I love the timeless ones!